We are excited to announce that the Bill & Melinda Gates Foundation has awarded Seattle University?s School of Theology and Ministry a third consecutive grant for its homelessness and poverty work. The Bill & Melinda Gates Foundation recognizes the school as a leader in new models for faith community engagement of social justice issues. The school will spend the next year identifying the best way to integrate the work of the Faith & Family Homelessness Project more fully into the life of the school and university, its coursework, and connections with faith community partners in the Puget Sound Region. Since its inception, the school has been committed to serving as a bridge between people of faith and the support systems that serve those in need. The Faith & Family Homelessness Project?will start its fourth year of operation in July. Fourteen interfaith congregations representing more than 18,000 individuals in the Northwest have been involved in the project, learning as faith communities how to discern the most effective role their community can play in helping families negotiate within governmental and private support systems. The project has created new opportunities for dialogue and the promotion of understanding and action with governmental policy makers, service delivery agencies and local congregations. A current effort by the project is to support Seattle?s Committee to End Homelessness in the release of its new Strategic Plan. ? In this transition year, we will continue to explore new and promising avenues for harnessing the power of the faith community to build public will, and foster deeper community collaboration around social justice issues like homelessness and poverty. ?If you would like to join us in this discernment, please tell us what you think! As part of our partnership with the Committee to End Homelessness, the school and project are working to connect faith communities with the One Home Campaign, an effort recruiting landlords to rent to homeless families. ? 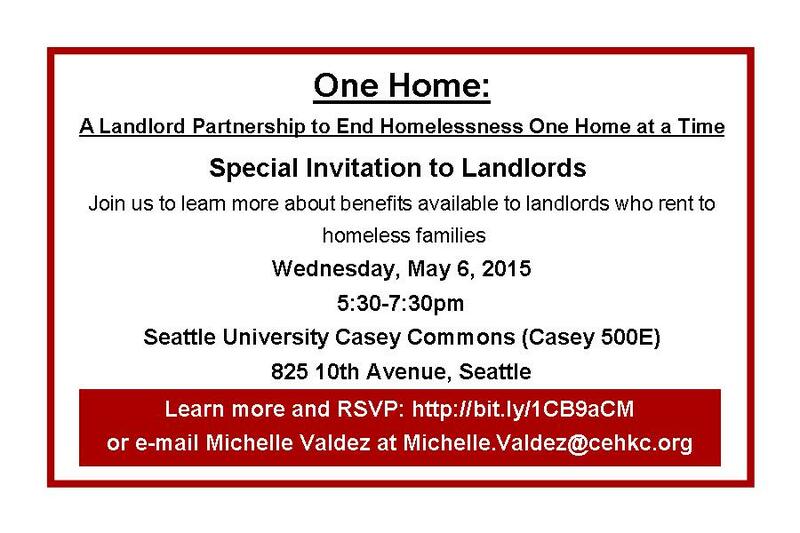 ?Invite all the landlords you know to our special Landlord Appreciation Reception where they?ll learn more about the One Home Campaign. You can find materials here: Landlord Appreciation Event Invitation;?Landlord Appreciation Event Poster for your bulletin board; JPEG Notice (also in GIF format) for your congregation bulletin. ?Talk to us about hosting a One Home coffee or happy hour in your congregation. This past month, staff Program Manager Lisa Gustaveson was asked to write an article for the Washington Post. Thanks to Northwest Catholic Magazine for featuring a special piece on the school's latest Poverty Immersion Workshop hosted by the Faith & Family Homelessness Project. Read the full article here.